The portholes Pipes Register without fire resistant function are made from galvanized metal sheet of 1.2 – 1.5 mm sheet and frame, ready to be received directly at the construction work. 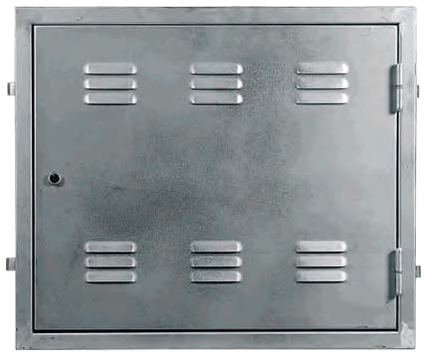 We cover a wide range of applications such as portholes of records of water meters, electricity, elevators, gas, communications, niches, etc … Built with a padlock or a lock key approved by the companies. We also have the option of potholes prepared to insert the hatches for finishing materials of the facade, such as caravan and mortars, where they will be located achieving uniformity in the ornament. We manufacture any size and configuration, tailored to the specific needs of each client. More information can be drawn from the catalog in the download area. We have permanent stock in factory of the standard models.